With leads coming from so many different places —calls, your website, ILSs, email, even social— staying on top of them is no easy feat. Continually refining your tracking and follow-up processes is key. Fittingly, automated lead nurturing generated a lot of discussion during this week’s #AptChat. It’s been a hot topic in the apartment industry for awhile now, but lots of marketers still have questions about its use, namely how to find the right balance of automation and personalization. Q1: What are the primary ways you’re tracking prospects today? What marketing/ad data sources do you reference most often? Q2: What trends have you noticed in your prospect data? Has the data caused you to shift how you’re marketing? If so, how? Q3: What are some key prospect data points our industry needs to pay more attention to? Which metrics get too much attention? 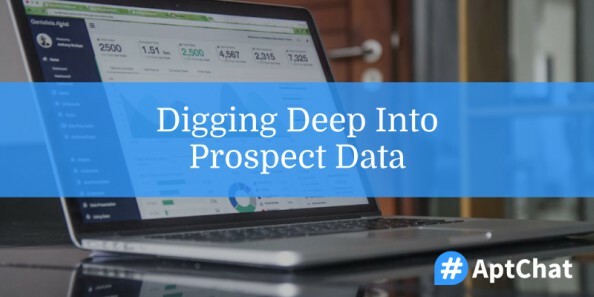 What are the primary ways you’re tracking prospects today? What marketing/ad data sources do you reference most often? What trends have you noticed in your prospect data? Has the data caused you to shift how you’re marketing? If so, how? @kharahouse @AptChat Wonder if your CRM can do email notifications for leads that go directly to the CRM. What are some key prospect data points our industry needs to pay more attention to? Which metrics get too much attention? @AptChat Personally, I’d like to see more leads come in with MI dates and Employers listed. #AptChat So many generic ones streaming in! @Respage @AptChat Yes, why do so many companies use generic, BORING landing pages on property pages? #AptChat Or, sites that are hard to navigate? @helloHyly @RokitNowInc @AptChat @AthleteatHeart @mwhaling @MsMin I agree, a personal touch is always great customer service. Our next #AptChat is slated for Tuesday, May 2, 2017 at 12 pm Eastern, and we’ll be discussing how to keep your marketing consistent. In the meantime, be sure to sign up for #AptChat updates to get these recaps and more delivered straight to your inbox!